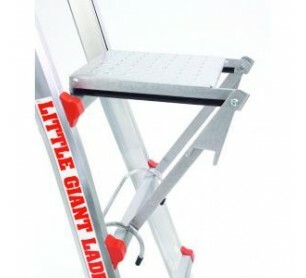 Little Giant Ladders work platform - Model 10104-Work Platform. The versatile Work Platform fits on the rungs of any Little Giant multi-use ladder and is rated to hold up to 375 lbs. Use it as a tray for a paint bucket or tools, or use it as a sturdy, comfortable standing platform. Now you can stand on your ladder for extended periods without sore feet and bruised shins- you can work with both hands in any direction. 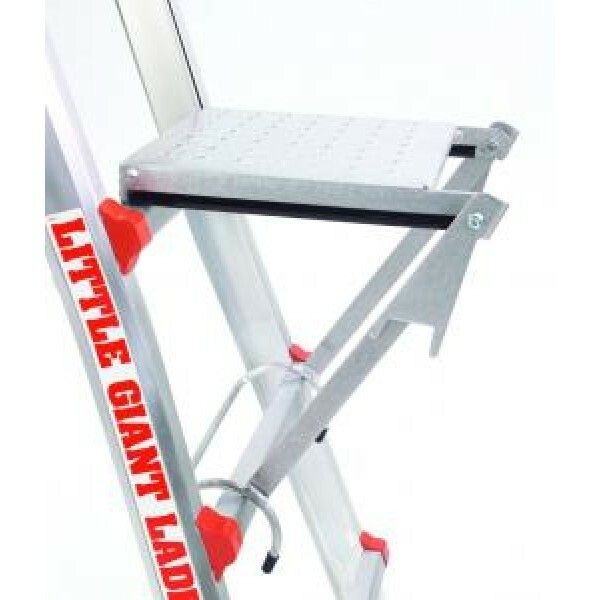 The Work Platform's unique design also makes it easy to store inside your Little Giant ladder so you won't have to worry about losing it. The Work Platform also serves as a stabilizing spreader bracket for your Little Giant's trestle-and-plank scaffolding system. Stand securely and comfortably on the work platform's broad surface (rated to hold 375 lbs.) at any safe height on the ladder. Maintain better balance, work from 360 degrees freely with both hands, and finish your project in half the time. Use second work platform to hold your paint, tools or whatever you need to get the job done.